Behind me as I write is a forest of handlebars and wheels. A wheelchair and a walker were delivered this morning by a very personable man who likes dogs. Just as well because Taylor never takes ‘no’ for an answer. For the first time ever Galileo stayed in evidence rather than hiding. He had little choice because Clive had hold of him, but after a while he stayed on the sofa of his own accord. Galileo’s greatest desire is for me to go outside and make him feel safe to run around. He’d already had a wonderful time earlier (while I was pruning) careering at breakneck speed up and down the slopes of the orchard and olive grove and taunting the neighbour’s dogs which are shut in behind a fence. But when I changed the lens on my camera to take some shots of the newly-arrived equipment, he thought this was a sure sign of another grand jaunt in the garden. 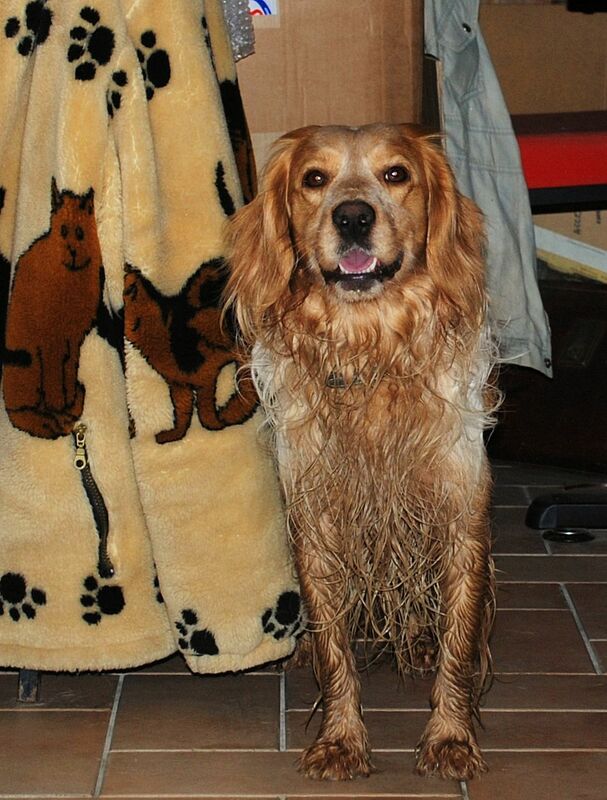 In the end I couldn’t refuse him and took him outside for a short while. I mean who could refuse a dog that looks at you like that? When the white montbretia at the front of the house looked like it was taking over the flowerbed, I was dismayed. I thought it was boring, colourless and much less attractive than the grape hyacinths it was displacing. Anyway last summer’s drought pinned it back, but a couple of days ago I noticed it was just creeping into flower. I had a close-up lens on my camera at the time so I photographed it – and it’s so pretty! 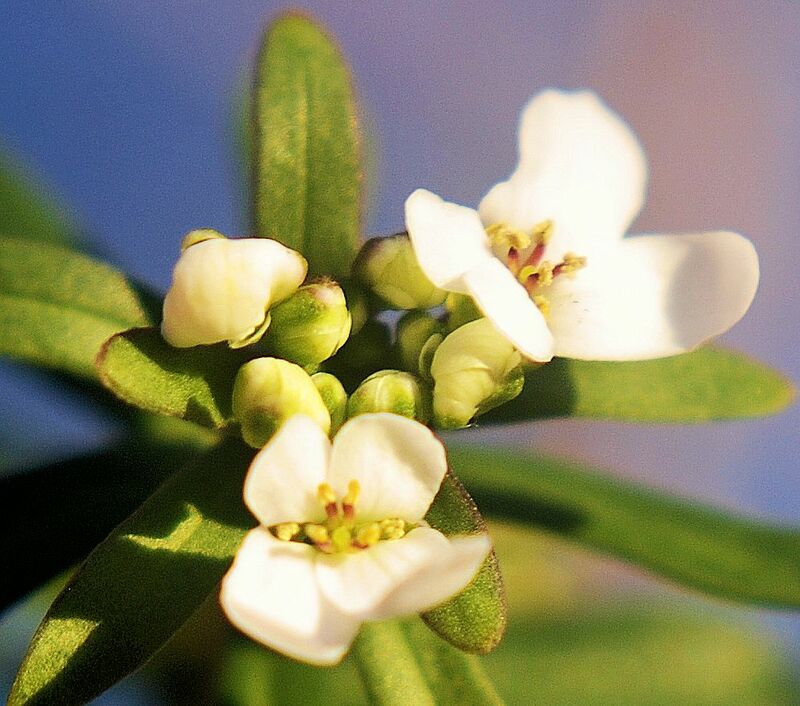 Like tiny sprigs of fruit blossom complete with pink-and-yellow stamens. It’s a reminder of what there is to look forward to in a month or so’s time. This tiny ladybird-like beetle must have woken in the sun today. It truly was a glorious day – warm, soft breeze, birds singing. The year is on the up! I was pruning a cherry tree when I spotted what I thought was a bead of gum – except that it moved. 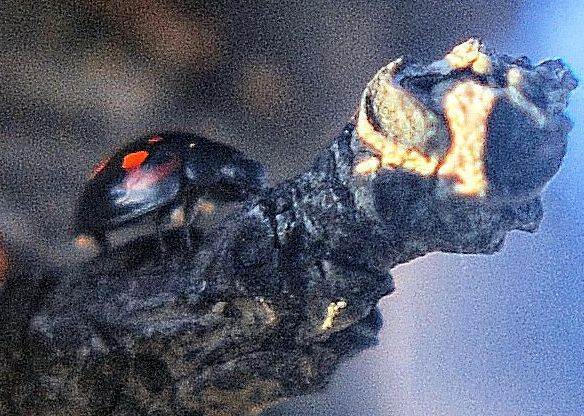 I fetched my camera with close-up lens and chased the surprisingly nifty beetle round and round the twig and the spurs, always missing my shot. When I downloaded the photos, I didn’t notice it at first. But then there it was – unexpected – the best portrait of the lot! I’m pretty sure it’s a black redstart and not a common redstart that’s been flirting and flicking about all over the courtyard for days. 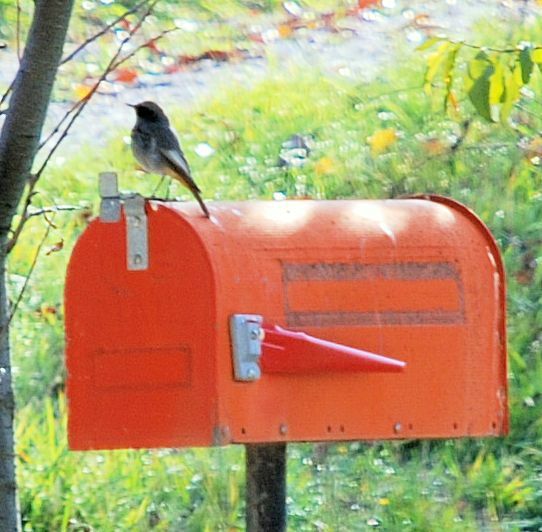 Except it ought to be a robin, sitting on a postbox like that. Out of a whole string of camera shots from the window, this was the only one vaguely in focus. PS I’ve now replaced the photo with a better one. The bird obligingly presented itself in profile and stayed still a microsecond longer! Before the discovery of the hornets’ nest, I went out at night to pick one or two of the few, tiny apples which the dry summer yielded. 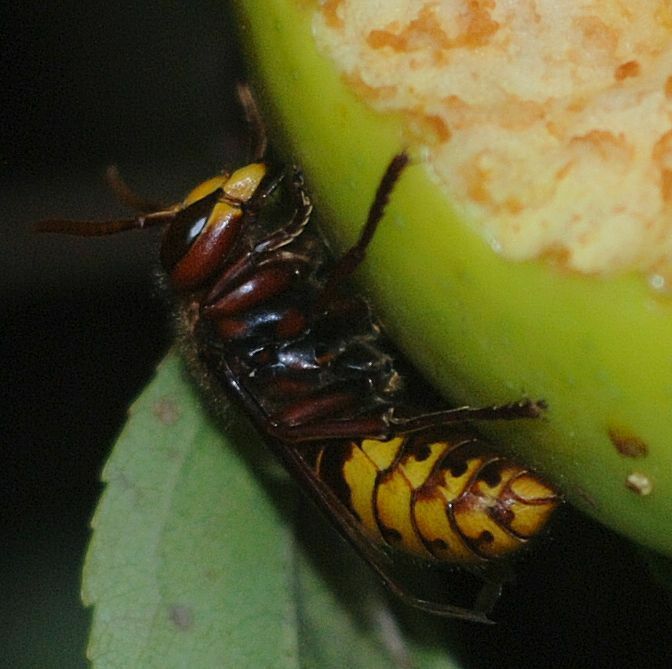 I noticed that some of them were nibbled almost completely away and there, clinging to as yet intact peel, were two gorged hornets, fast asleep. The flash of my camera in fact woke them up enough to groggily move a leg or two, but other than that they stayed still. I’ve heard one should never swat or squash hornets outside because of the pheromones attracting fellows to their aid, but I wonder if this applies at night? Anyway, rightly or wrongly, I left them to their slumbers. 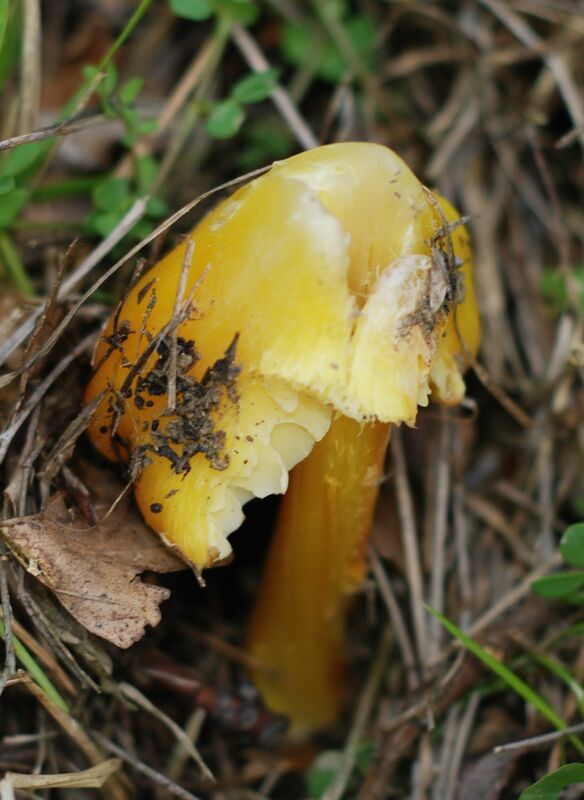 This fungus, partly concealed in the grass, looked like nothing so much as the rotten split end-part of a cucumber. … except that in this case it would have had to go over the top of a very large fig tree. I went back to the house for my camera, and a supermarket glove (the sort you wear to handle fresh produce) in case it was poisonous. I didn’t in fact touch it; just cleared the grass and dead leaves away from it. When I’d finished I could see that it had a conventional mushroom shape but that it had split open and the cap looked as if it had been partly eaten. It looked quite yummy and frosty-lemony, but I’m sure it was NOT. I haven’t managed to identify it.